The weather outside lately has been anything but fall-like, so for this week's setting we decided to take a break from the season inside as well! This gray, green and white setting is clean and crisp, and very much reminiscent of a warmer season. The feature here is the Alessi All-Time Dinnerware Collection, which has a casual shape and style, and a universal appeal. The table, which was set for two, featured Chilewich Boucle Rectangular Placemats in Melange to start, with iittala Kastehelmi Dewdrop Chargers in Grey, Alessi All-Time Dining Plates, and Alessi All-Time Soup Bowls all stacked together. For glassware, we took from two Schott Zwiesel collections, and showcased the Fortissimo Burgundy Glasses and the Forte Claret Goblets. Both offer a classic shape, with delicate stems that give them an air of sophistication. To each side, we set Libeco Home Polylin Napkins in Grass Green with Alessi Mu Cutlery forks on top. To complete the setting, we used the rest of this 5-piece flatware set. To the side, we set a Spencer Peterman Extra Small Spalted Oval Board (available in-store only) for coffee and tea service. Included were a duo of Alessi-All Time Mugs to match the dinnerware, and an Alessi Fruit Basket, Sugar and Cream Set. 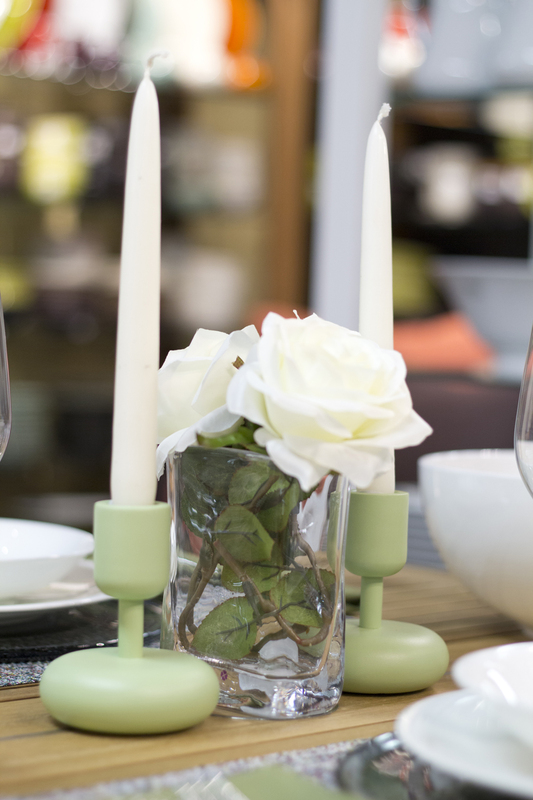 We placed a Simon Pearce Weston Petite Vase filled with white roses in the center of the table, and added iittala Nappula Small Candleholders in Celadon to either side to tie all of the colors together. Overall, a lovely setting, this week crafted by Didriks' store manager Katy. Thanks for the beautiful setting, Katy!